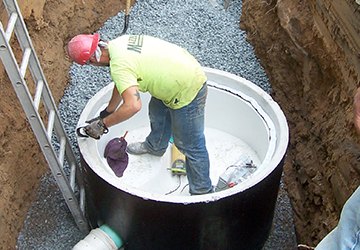 Hanover Engineering assisted East Penn Township with finalizing the Township’s Act 537 Sewage Facilities Plan and the design of a public sanitary sewer collection system to replace on-lot systems in an area with a large percentage of failing systems. The collection system consists of 8,750 linear feet of gravity sewer, 2,750 linear feet of low pressure force main, and a pump station to convey sewage under the Lehigh River to the Bowmanstown Wastewater Treatment Plant. Installation of the collection system required boring at two locations under state highway SR 895 and one under the PA Turnpike, as well as directional boring for the low pressure force main under the Lehigh River. The project was funded through a grant and loan received from the American Recovery and Reinvestment Act (ARRA) through PENNVEST, and by a small grant from the H2O-PA Program. Layout and design of the sewer system, pump station and related appurtenances. Design and permitting for the borings under SR 895 and the PA Turnpike. Design and permitting for the directional boring under the Lehigh River. Wetlands delineation and permitting for several wetlands crossings. DEP permitting for a stream crossing. Applications for grants and loans.